Join Rob & Mahadi Buthelezi on this very special Couples’ St Valentine Pilgrimage to the Holy Land — a time for couples to fall in love all over again with one another and with the faith! RENEW YOUR WEDDING VOWS AT CANA ON ST VALENTINE’S DAY! Arranged by Fowler Tours, South Africa’s premier Catholic pilgrimage organisers. ALL COUPLES WELCOME! We depart from Johannesburg to leave on our night-flight for our special Couples pilgrimage to the Holy Land. We land in Tel Aviv where we are met by our tour guide. We proceed to Nazareth we visit the Basilica of the Annunciation with the grotto where the Archangel greeted Mary with the words “Hail Mary, full of grace”, and the nearby church of St Joseph, or Carpenter’s Workshop, where tradition says the Holy Family lived. We see Mary’s Well, where Our Lady drew water. After lunch we check into our beautiful hotel where we can freshen up and get changed for our big event: the Renewal of Wedding Vows, on Valentine’s Day, at Cana, site of Our Lord’s first miracle at the wedding feast. 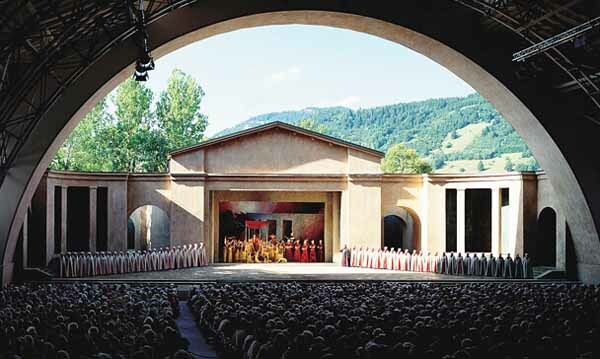 In the evening we have a wedding feast ourselves, with a dinner in a specially selected restaurant. Renewal of Wedding Vows in Cana. After our first breakfast as newly-weds, we go to the Sea of Galilee, around which most of Jesus’ public ministry took place. At Capernaum we can see the remains of Peter’s house and of a fourth-century synagogue built on top of the one in which Jesus preached (the foundations of which we can still see). 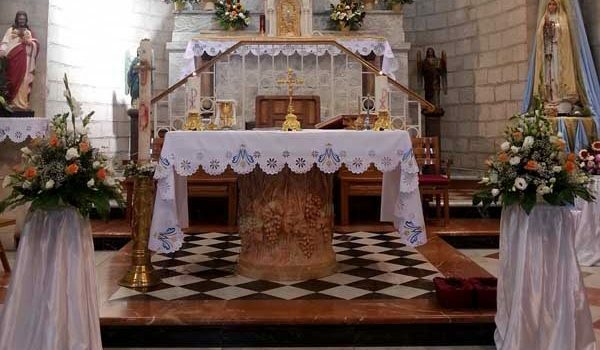 At Tabgha a church recalls the Miracle of the Loaves and Fishes, and the nearby chapel of Peter’s Primacy marks the place where Risen Christ entrusted the Church to St Peter. We drive up Mount of Beatitudes, on the slopes of which Jesus delivered his famous sermon. A highlight of the pilgrimage is the boat-ride on the Sea of Galilee on a recreation of a first-century fishing vessel, a time for both fun and for prayerful reflection. We invite you for lunch today, with an opportunity to eat the St Peter’s fish from the Sea of Galilee. After breakfast, we drive up Mount Tabor, site of the Transfiguration, from where we can survey the Jezreel Valley. Nearby we visit the village of Nain, where Jesus raised the widow’s son from the dead. 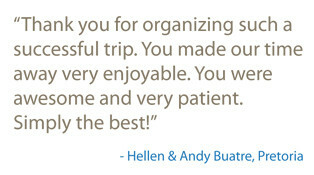 Here our Couples Pilgrimage will remember in prayer those who have lost their life partners. As Mary did after the visit by the Archangel Gabriel, we head south from Galilee to the Hill Country of Judea. At Ein Kerem, today a part of West Jerusalem, we go to the beautiful Church of the Visitation where Mary’s visited to her pregnant cousin Elizabeth (and her mute husband! 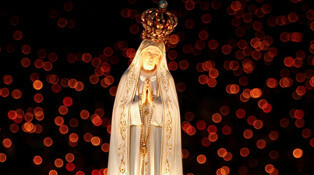 ), during which Our Lady recited the Magnificat. We then visit the church that marks the birth of John the Baptist. 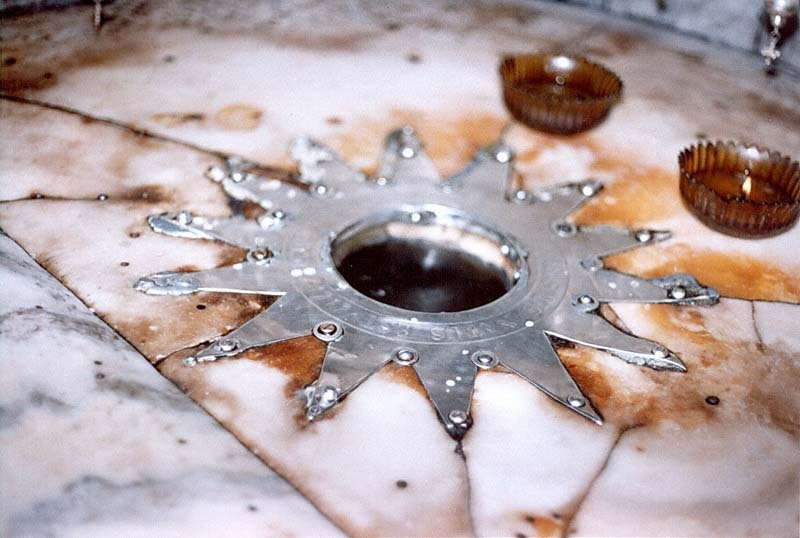 The silver star that marks the place of Jesus’ Nativity. Today we explore Bethlehem, where Jesus was born. 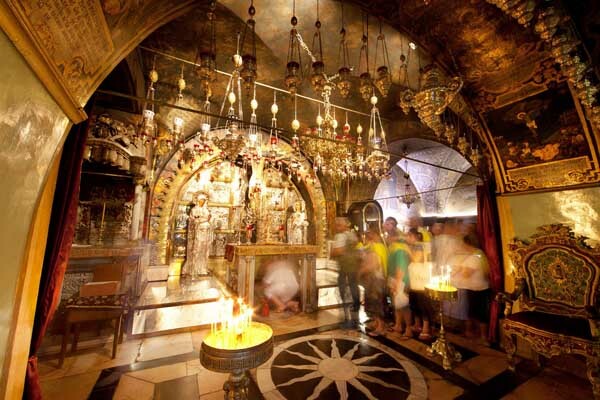 In Bethlehem we visit the ancient Basilica of the Nativity, where a silver star marks the place of Jesus’ birth, and the adjacent St Catherine’s Church. At the Milk Grotto, the cave where tradition says the Holy Family hid during the Massacre of the Innocents. This is a special place for couples who are praying to have a child. Shepherds’ Field, where the angels announced the birth of the Messiah to the shepherds, is one of the Holy Land’s loveliest sites. In Bethlehem we have the opportunity to do some souvenir shopping. After breakfast we visit Bethany, the town where Jesus often stayed with his friends Mary and Martha, and where he raised Lazarus from the dead. We then drive to visit the Qasr El-Yahud baptismal site on the River Jordan, which the Vatican recognises as the authentic site of the baptism. There we renew our baptismal vows. We pass through Jericho, with a view on the Mount of Temptation, the place where Jesus spent 40 days and 40 nights in the desert. We round off our day at the Dead Sea, where we can float on the mineral-rich water. Jerusalem! We begin our pilgrimage to the Holy City on top of the Mount of Olives at the small chapel, now a mosque, which marks the spot from which Catholics believe Christ ascended into Heaven (see His reputed footprint in a stone there). As we walk down the mount we visit Paternoster Church, where the Lord’s Prayer is displayed in hundreds of languages, including several South African versions, and Dominus Flevit Church, which is on the spot where Jesus looked at Jerusalem and wept for its impending destruction. At the foot of the mount we arrive at the Garden of Gethsemane with its ancient olive trees, and the magnificent Church of All Nations with the Rock of Agony, on which Jesus is believed to have prayed before His arrest. Across the street we visit Mary’s Tomb, from which Our Lady was assumed into heaven. On Mount Zion we visit the impressive Dormition Abbey, where Our Lady fell asleep, the Cenacle (Upper Room) which commemorates the Last Supper, and the Church of St Peter in Gallicantu, where Jesus was tried by the Sanhedrin, kept in a dungeon, and where Peter denounced Our Lord three times. Next to the church we can see the steps on which we know Jesus actually walked! Calvary. Beneath the altar pilgrims touch the rock on which the Cross stood. This is the day we follow the Stations of the Cross, the Via Dolorosa in Jerusalem. The Way of the Cross culminates in the Church of the Holy Sepulchre, our faith’s most sacred site. Here you can touch the rock where the cross stood and pray in the tomb from which Our Lord rose from the dead. 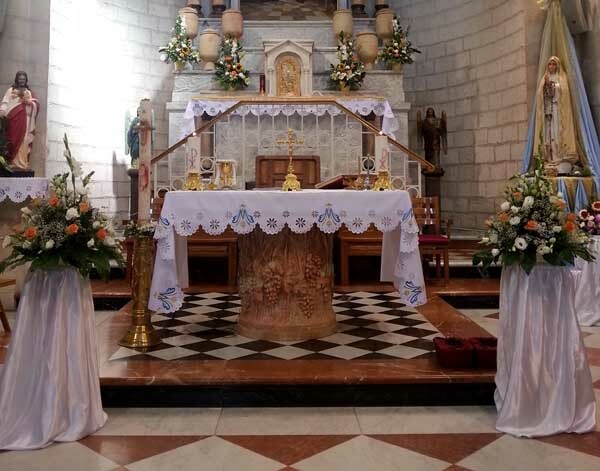 We also visit the birthplace of Our Lady, the lovely St Anne’s Church, a Crusader church on the site of the home of Saints Anne & Joachim, parents of the Blessed Virgin. At the Pools of Bethesda Our Lord cured the lame man. After an unforgettable journey we come home, spiritually refreshed and with the glow of newly-weds, remembering the words of the Psalmist: “They that trust in the Lord shall be as Mount Zion, which cannot be removed but abides forever” (125:1). 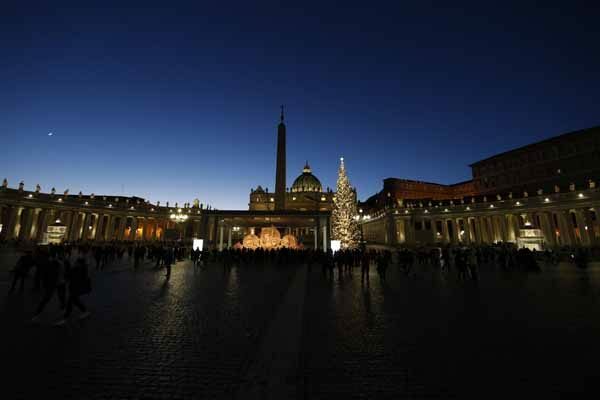 Mass will be celebrated at sacred sites every day. Daily lunch in selected restaurants included. NO VISAS REQUIRED FOR SA CITIZENS! 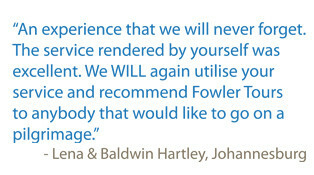 Includes All flights ex-Johannesburg (incl. airport taxes), accommodation in 4-star hotels (sharing) with breakfast and dinner, daily lunches in selected restaurants, transfers, travelling on air-conditioned luxury buses, English-speaking tour guide, entrance fees, preparation material. Excludes tips, travel insurance, and personal expenses. A deposit of R4,800 accompanied by the booking form (one per person, included in the itinerary) secures your place on this unforgettable pilgrimage.